CareSource complies with applicable state and federal civil rights laws and does not discriminate on the basis of age, gender, gender identity, color, race, disability, national origin, marital status, sexual preference, religious affiliation, health status, or public assistance status. CareSource does not exclude people or treat them differently because of age, gender, gender identity, color, race, disability, national origin, marital status, sexual preference, religious affiliation, health status, or public assistance status. CareSource provides free aids and services to people with disabilities to communicate effectively with us, such as: (1) qualified sign language interpreters, and (2) written information in other formats (large print, audio, accessible electronic formats, other formats). 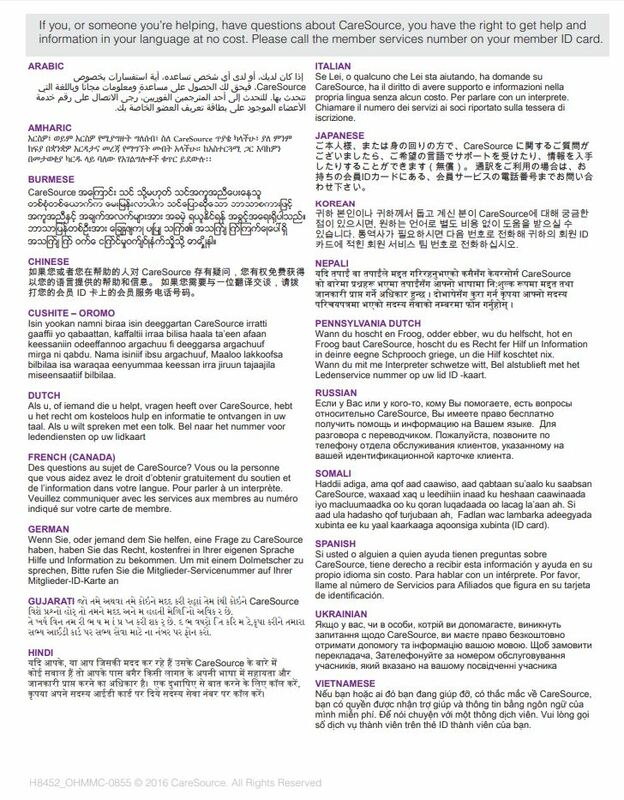 In addition, CareSource provides free language services to people whose primary language is not English, such as: (1) qualified interpreters, and (2) information written in other languages. If you need these services, please call the member services number on your member ID card. You can file a grievance by mail, fax, or email. If you need help filing a grievance, the Civil Rights Coordinator is available to help you. To view in .pdf format or to print this content, click here. If you do not have your member ID card or you are not yet a member, we can help. Contact Us.